"Sunday's Tsunami has killed lot of our children and mothers. Our national leader Mr.Pirapaharan has issued a clear instruction to us that we should not lose our children anymore in the future. He fears that our children are facing danger of being succumbed to epidemic after Tsunami devastation,"said Mr.Thooyavan, Head of LTTE Planning Department addressing representatives of international and national non-governmental organizations in Trincomalee district now engaged in relief works in Tsunami affected coastal areas. 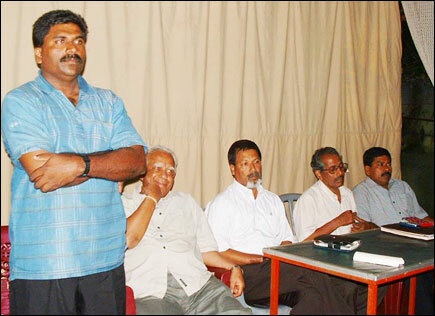 Mr.Elilan speaking, Mr.Sampanthan, Mr.Selvin, Mr.Thurariatnasingham and Mr.Sanjai of LTTE are seated. The meeting was convened by the LTTE Trincomalee district political secretariat Thursday night in the Trincomalee New Silver Star Hotel to discuss the shortcomings in the distribution of relief supplies to thousands of displaced families residing in camps and also to identify their urgent needs. 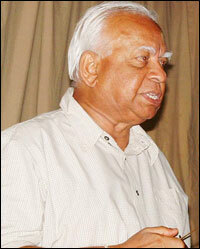 LTTE Trincomalee district political head Mr.S.Elilan presided. He at the commencement outlined the objective of the meeting and brought to the notice of the participants the sufferings of victims in camps. He said managers of such camps would reveal the true situation now prevailing in such camps. A LTTE woman cadre who is in charge of a camp, which is located in Chelvanayakapuram Tamil Maha Vidiyalayam, said the number of refugees given shelter in the camp was about seven thousand. Because of a rumour another Tsunami was on its way the number of inmates has swelled to ten thousand Thursday noon. She said not a single government agency has supplied relief to these refugees. She said seven diarrhoea cases had been detected in the camp and sent to hospital because of unhygienic condition without proper toilet facilities and good drinking water. The person in charge of another camp which is located in Orr's Hill Vivekananda College said about nine thousand displaced are given shelter in this camp. Inmates are not provided with adequate food. Pregnant mothers are not given nutritious food. They are allowed to sleep on the cement ground without mat. Babies are not given milk food and feeding bottles. Health authorities are not properly looking after the sanitary facilities in the camp. No government agency has provided any assistance to these victims. If this situation is allowed more people will die of epidemic, he said. 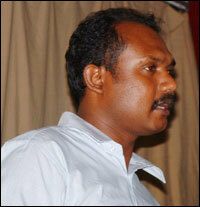 Mr.Kavinban, a LTTE cadre said he has visited several camps in the district following Tsunami disaster. But he could say that displaced given shelter in these camps are now facing the real danger of epidemic disaster. Unless immediate action is taken, more people would die due to disease, he warned. Parliamentarians Mr.R.Sampanthan, Mr.K.Thurairatnasingham and Mr. Ireneus Selvin, SIHRN Director addressed the meeting, sources said.